All three styles of Mille-Tie are revolutionary improvements over any other tie on the market, offering benefits and advantages over any supposedly competitive product. 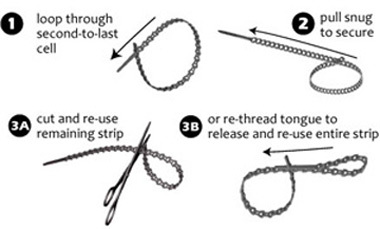 Up to 5 Ties per Strip: Mille-Ties are able to be cut into as many as five smaller, completely usable separate ties and thus are worth that many more times the value of a single-use tie. Won’t Damage Insulation or Bark: Mille-Ties are flexible but strong, without the stiff edges that tighten and cut into the insulation protecting cables and wires and dig into the stems and bark of tender plants. Won’t Constrict Data Flow: Mille-Ties are stretchable and thus do not constrict the flow of data the way hard nylon ties can. Releasable and Reusable: Mille-Ties are easily releasable and thus reusable over and over. Can Organize Related Bundles: Mille-Ties are able to form multiple loops with a single Mille-Tie and thus organize multiple bundles close together. No Dangerous Cut-Off Ends: Mille-Ties are without any sharp cut-off tips potentially hazardous to other component parts, people and animals. Almost No Waste: Mille-Ties are environmentally friendly as tails are reused as separate ties, eliminating the waste that deposits 80% of traditional nylon ties in landfills. Mille-Ties are already used in industry, government, the military, and the home. In the United Kingdom, where Mille-Ties were invented, customers include major industrial leaders such as Microsoft, Coca-Cola, the Royal Navy, and Bombardier, plus countless home and DIY users. Mille-Tie® and QuickStrip® are registered trademarks of Millepede® International Ltd.